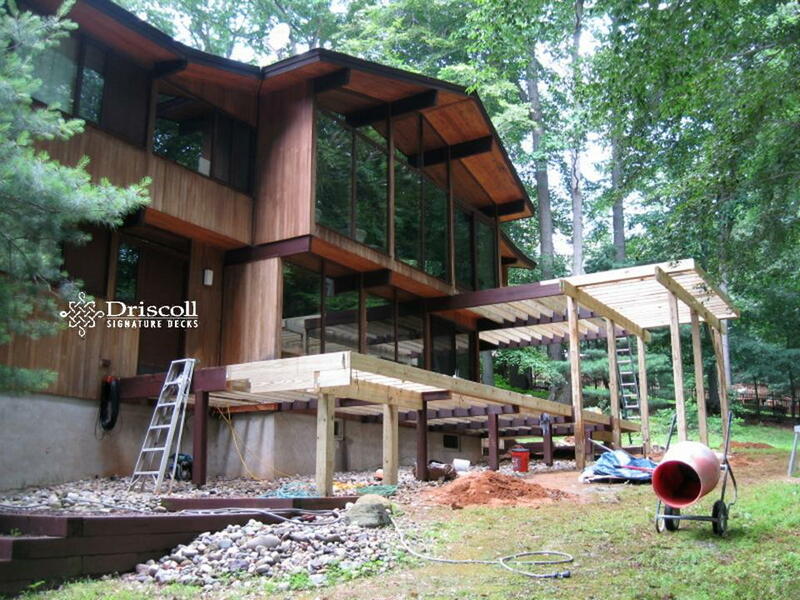 This beautiful wooded hillside home had thru-house engineered beams which also supported the outside decks, so we thought it best to leave the beams in place for these Ocean County Decks. 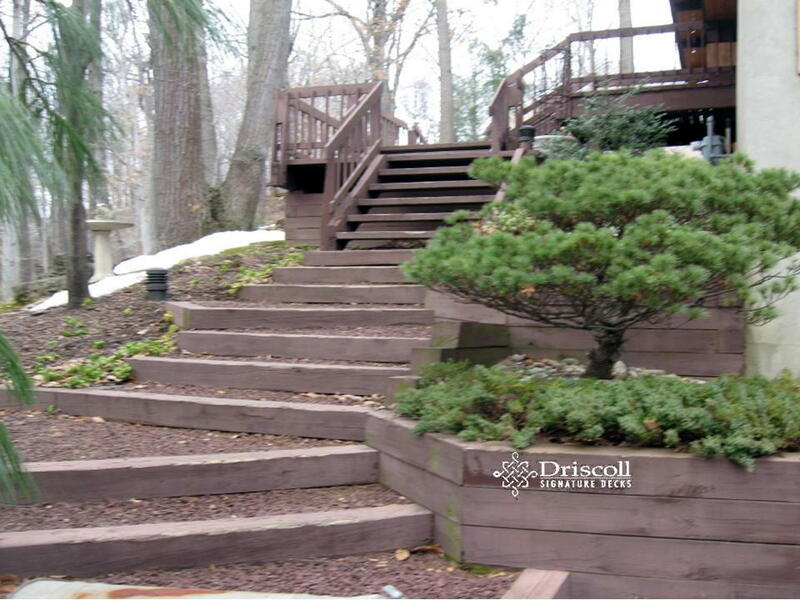 You will find quality deck designs, consultation and excellent craftsmanship when you search for Driscoll Signature Decks at Deck, Decks, Deck Builder, Deck Contractor, Decks NJ, Deck Builder NJ, Deck Contractor NJ, Ocean County Decks, Decks Ocean County NJ, Deck Ocean County, Deck Ocean County NJ Ocean County Decks, Ocean County NJ Decks Ocean County Deck, Ocean County NJ Deck, Deck Contractor, Ocean County, Deck Contractor Ocean County NJ, Ocean County Deck Contractor, Deck Builder Ocean County, Deck Builder Ocean County NJ, Ocean County Deck Builder, Ocean County NJ Deck Builder, Ocean County NJ Deck Contractor. 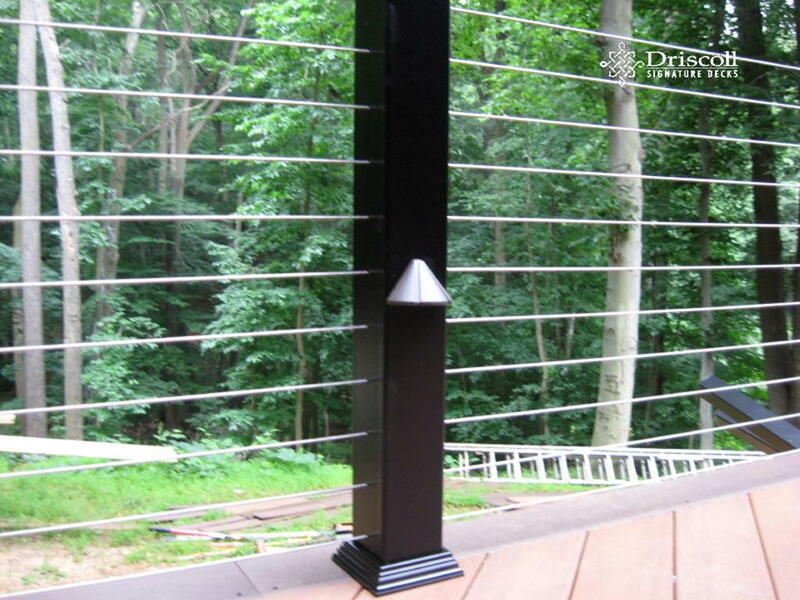 Although, some of these engineered beam supporting the decks looked like they were ready to be replaced – so we did! Also note the wooden 4×4 railroad-tie styled landscape stairs at the bottom left of the above image and what we did to them below. 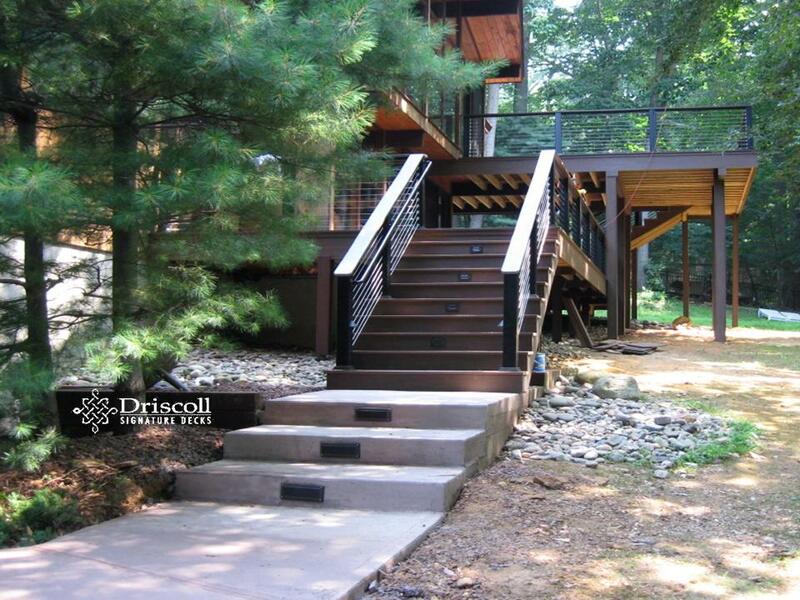 After a few weeks of design changes, ‘The Team’ came up with this fabulous deck design which incorporated, and repaired the engineer beams and extended out the size of the lower deck and doubled the size of the upper deck, with wide platform stairs to the grade. 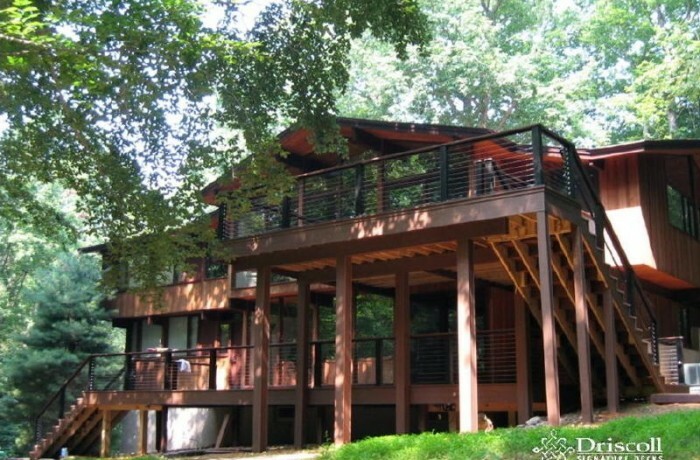 If you look carefully at the lower deck underneath the upper deck, you will see how we ‘doubled-loaded’ with 6×6 structural posts for both the lower and upper decks and the engineered beams (darker brown) were restructured and extended out for this bi-level enlarged deck design. Also notice that we extended the lower deck in the left center of the image to fill in the space where we removed the old ‘pocket’ stairs. 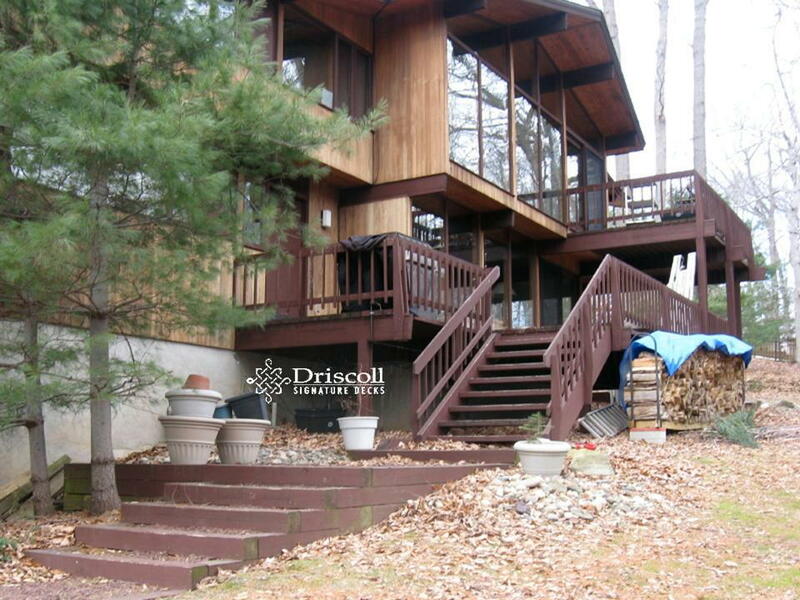 Here we installed this Acacia-color-vinyl decking boards for the main deck and incorporated a complimentary darker colored parting board and picture-frames and border patterns for this upper deck surface. As you can now see, we used these beautiful clear-view stainless steel cable railings with black vinyl posts and accent lighting, on the posts and stair risers (in pictures below). 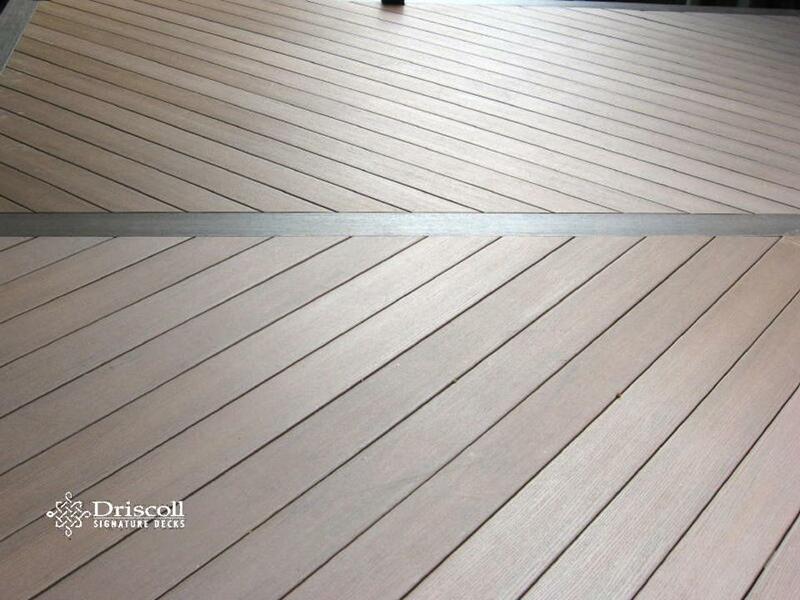 Please also note the darker shaded border pattern to accentuate the outside edges of this custom deck design. 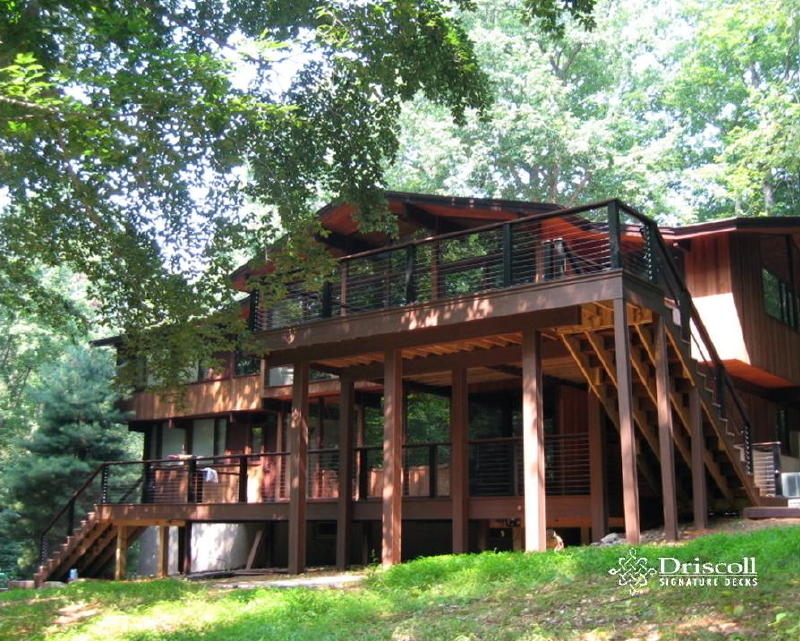 Isn’t it great when a fabulous deck plan comes together. 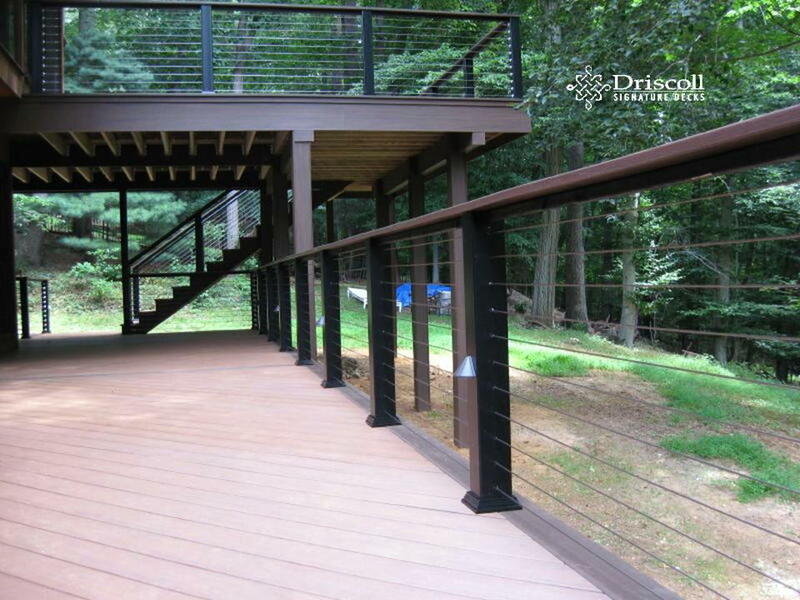 Just check out all these classic Driscoll deck lines and features: vinyl decking board with parting board (in distance) and border patterns under the stainless steel cables railings, with the lovo accent accent lights on the black vinyl railing posts, then the matching fascias (showing here on the upper deck) and the matching cladding on the structural posts for the upper deck, and lastly in the rear is the platform stairs to access both the lower deck and the grade. Here are the new wide stairs down towards the driveway and garage and note the lovo accent lighting in the stair risers, with the same stainless steel cable railings and a graspable handrail. 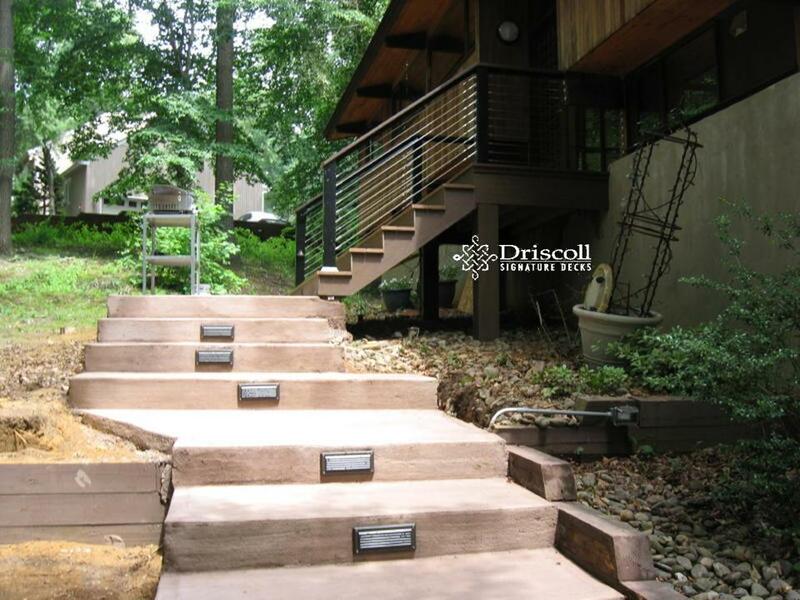 Then we removed those old railroad-tie wooden steps and installed ‘tinted concrete’ landscape steps to complement the Acacia vinyl decking boards and then additional accent-lighting in the risers from the deck down through the concrete walkway. We then started working on the front entranceway, which landed on the opposite side of the driveway from the rear walkway. This existing stairs offered us another whole set of challenges. Number one was the uneven surface, the random sized treads on the existing railroad-tie stairs, but we had to match the the houseline and the turn here at the bottom, and make have the top wooden/vinyl stairs and land the right way. But, as you can see, we made it work with the same colored ‘tinted-concrete’ with the lovo accent riser lighting with matching stairs with the same stainless-steel cable railings and vinyl decking boards. Fear-not because Driscoll loves these kind of challenging projects. 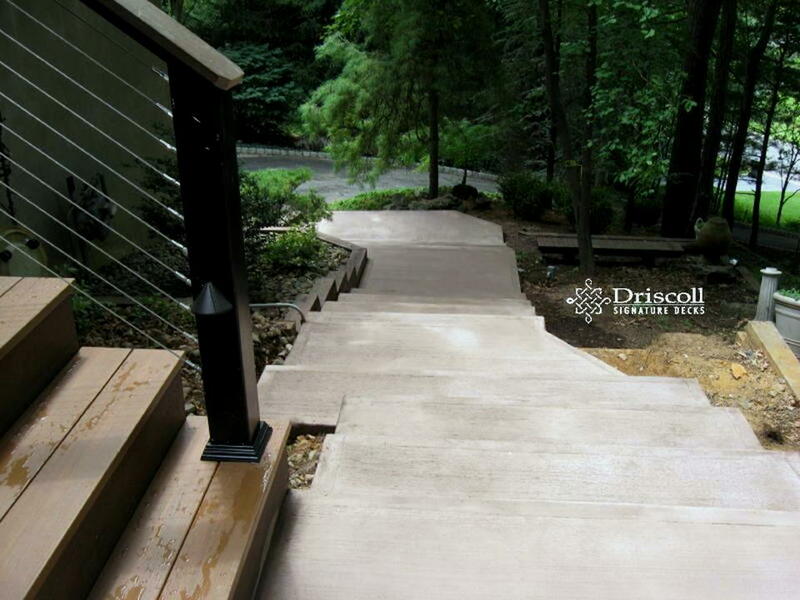 Now, this is classic Driscoll design, with the matching front entranceway, the right transition down from the wooden stairs to the tinted-concrete and the treads laid out for a smooth walk without having to worry about tripping over the uneven treads and risers before Driscoll came to the rescue. 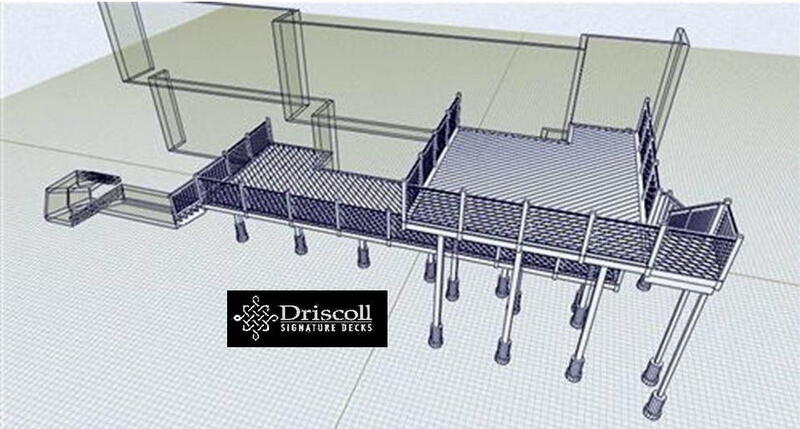 As you can see, these are classic Driscoll Signature Decks and work on both the rear decks and front entrance – Driscoll quality through and through..!